Important (Feb 2019): The 6520 Weatherlink for Mac product remains available but we do not encourage its purchase. Davis effectively stopped updating Weatherlink for Mac some time ago (as indeed they have now also recently done with the Weatherlink for Windows program). As a result, the likelihood of compatibility problems with the latest MacOS versions has increased; these issues can usually be fixed but we do not have the specialist Mac knowledge to be able to offer support in individual cases and all the information we have on this topic can be found on our Davis knowledgebase..We therefore recommend that Mac owners use alternative software, especially the Weathercat program mentioned below – we do not sell Weathercat but it is available from the Weathercat website. Users will still need the Weatherlink USB logger hardware (or an alternative that is compatible with the software to be used, such as the WiFi logger). The USB logger must be purchased within either the 6510 Weatherlink for Windows pack or the 6520 Weatherlink for Mac packs, simply setting aside the software CD that comes with the pack. The USB logger hardware is identical whether purchased in the Windows or Mac packs. The data logger included in this pack is exactly the same USB logger as supplied with the 6510USB Weatherlink version for Windows and with the same USB cable, but, although it bears the same name, the Weatherlink for Mac software is a significantly different version of the Weatherlink software. 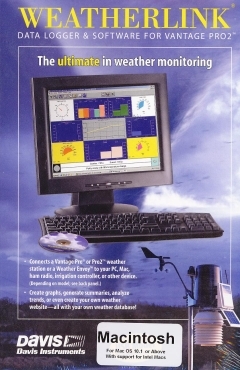 In general terms, the Mac Weatherlink program offers broadly similar features to the Windows version, but the Mac version does have significant differences and limitations compared to the Windows version. In the descriptions below we’re focusing on these differences in the Mac version from the Windows version – for a more general introduction to Weatherlink features in general, please see the main Weatherlink page. Limitations of the Mac Weatherlink version, of which we’ll mention a few below. In general, Weatherlink for Mac is a perfectly serviceable program which is run successfully by a substantial number of users around the world and offers broadly similar features to the Windows version. But if you’re concerned about the details of any feature mentioned below or indeed availability of any other specific feature not explicitly listed below we suggest that you make further enquiries before purchasing the Mac version. Weatherlink for Mac is compatible with all recent Mac OS versions, including Snow Leopard. But it is important to use the appropriate Weatherlink program version. For example, Weatherlink for Mac v5.1.0 is required for use with Snow Leopard. Please remember that data delivery from the Mac’s USB port to the Weatherlink program is still usually mediated by means of a third-party USB driver written by the maker of the USB chip used in the logger (which is Silicon Labs in fact and not Davis). With a new Mac operating system version it will often be this USB driver that needs updating via a download from the Silicon Labs website, while the Weatherlink program itself remains fully compatible between OS versions. The most cost-effective way of buying the alternative software version is as the Additional License Packs, which simply consist of a CD containing a full copy of the relevant software plus an installation booklet – see sidebar for prices. Note however that there appears to be no established way of migrating existing Weatherlink data files from one OS version to the other. To reiterate our advice above: In general, Weatherlink for Mac is a perfectly serviceable program which is run successfully by a substantial number of users around the world and offers broadly similar features to the Windows version. But the Mac version does have some significant limitations – if these are relevant to your expected use of the software then you might wish to consider running a Windows PC instead in order to gain access to the full set of features and support that the Windows Weatherlink version offers.